Best Sandwich Ever? Where have we heard that before… Hm, must have dreamed it. Anyway, Tyler Florence came to Good Morning America today with two local NYC food trucks in tow to crown the completely original Best Breakfast Sandwich Ever while dishing on the new format of The Great Food Truck Race, which he hosts on Food Network. This season, as opposed to showcasing already established food trucks in a coast to coast race, the show is focusing on “the dreamers” by casting eight teams of wannabe food truckers and seeing how they fare. The series kicked off this past Sunday on Food Network. 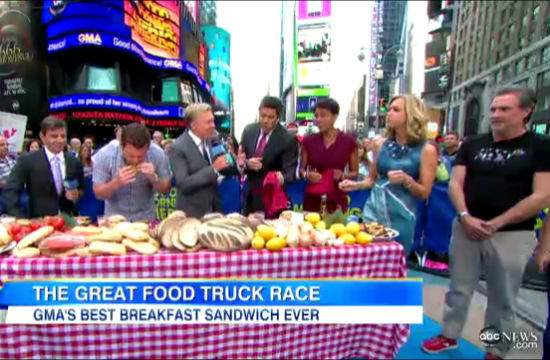 On hand to partake in the festivities on GMA were NYC food truck mainstays Schnitzel & Things and Milk Truck, both of whom were serving up their best breakfast sandwiches to Florence and the anchors. Schnitzel’s pork belly, egg, and cheese put up a decent fight, but ultimately, Milk Truck’s applewood smoked ham and gruyere on rye won.